Apple yesterday announced a 4 inch powerful phone, the iPhone SE which perform equal as iPhone 6S. Ashwin covered the details of the device Apple iPhone SE with 4-inch display, Touch ID launched for $399. 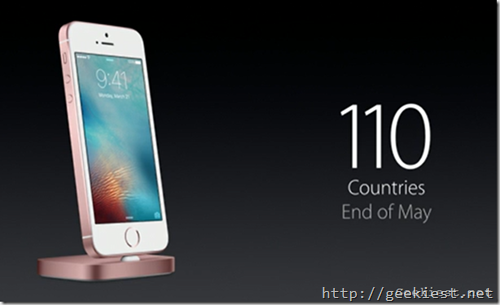 Initially the device will be available in 12 countries. The Apple iPhone SE has been priced at $399 for the 16GB model, and at $499 for the 64GB model. That is about Rupees 26,546 and 33,200 respectively. The price is higher than the iPhone 6. The Grey color, 16Gb variant is available for INR 36,000 at Amazon India. But if you compare the price of these Phones in US you will find that iPhone SE ($399) is much cheaper than the iPhone 6($549)and iPhone 6S ($649). iPhone 6 have a 4.7 inch display compared to the iPhone SE. iPhone 6 have an older processor and 8Mp camera while the SE will have a newer processor and 12 MP camera. So what do you think about the pricing of the new iPhone SE ? Availability and Price of the new iPhone SE in India.